Today I want to introduce you to Justin Pepin, the owner of Yogi’s Fine Woodworks & Tiny Home Designs — a new handcrafted tiny house building company. I’m a budding tiny builder with 20 years of high end finish carpentry, furniture making, home building, and timber framing experience, on top of 2 bachelors of fine arts in sculpture and furniture design. And boy can you tell! Pepin has been invited to show off his 1/6 scale models of his tiny house designs at a booth at the Midwest Outdoor Expo at the end of the month. 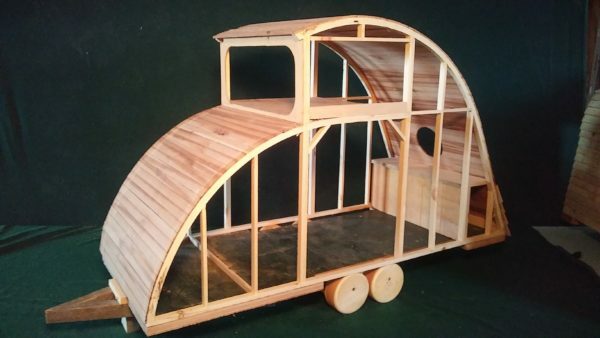 He is waiting on an interested buyer to build his first full-scale design. About the house below: “This is a 1/6 scale model of a tiny timber frame I’ve been working on. The first floor is 18′ x 9′, the second 24′ x 12′. Two squares on two squares. It’s designed using sacred geometry similar to the methods used to create the great cathedrals of Europe, to allow as much light inside as possible. The cupola is mean to rest atop the roof desk during transport, and jacked up and across the copper roof into place. Imagine stained glass everywhere and an ornate wrought iron handrail/baluster system enclosing the glass roof deck. It includes a wet bath with fold down bench when used as sauna/steam room. 9′ live edge walnut counter top with ample storage below. I kept an open floor plan to allow for antiques and a pull out couch. The stairs double as a door for privacy between levels. There will be a deck at both ends that fold down. Wow I love those windows! Such a fun new design! Can’t wait to see one in person. Now there’s a business sign! Wow! Looks like a giant wave! Wow! Beautiful asymetry and curves. Beautiful craftsmanship. Can’t wait to see these in real size. Hi Alex, the last post about the tiny house seninars did not have a comments section, so I came back here to comment. An event like a tiny house convention or seminar is great income for the cities in which they are held, but why not spread the wealth? Why not have some of these events in smaller towns like mine that are only an hour or so away from the larger towns, but have much rich history, arts, antiques, and other things to offer visitors who come to attend the events or just to see the houses. These smaller towns could really benefit from the added income of visitors. Right here in Globe, we have at least four rv courts that I know of, and a huge one at the cassino on the rez, and non hookup accomodations at the fair grounds for overflow. My rv court is getting ready to start building an additional 28 site park just across the road that should be finished sometime in October. There are numerous places that an event could be held, and people here in AZ are used to travelling an hour or so to get anyhwere. I’m just saying. It’s just a thought. Just wanted to add – on the cupola one, I’d lose the porch and use the space for a better bathroom and storage. Yes that was very clever! Wow, wow, wow! This is so fun, so fanciful and interesting! Is there access to the way top with the round window? I think I know a lot of people (including me!) who would love even the model as a dollhouse. Great job!! Can’t wait to see more. Good question! I think so? But I’m not 100% sure. Great Bird houses, but I would think hard to build as a regular structure to live in….! Really? You’d prefer a dry bath? How bizarre! I love what I see but I wouldn’t be living outside the house. I will reserve my decision until I can see what it will look like inside the house.